All African students will have access to high-quality training in debating if three Monash University alumni achieve their dream. 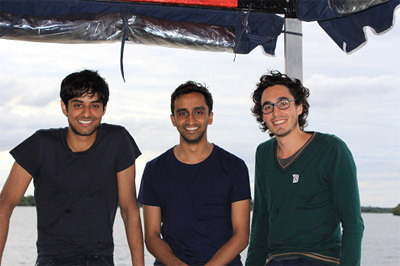 Through their charitable organisation, African Voice, Monash Association of Debaters (MAD) members Kiran Iyer, Sashi Balaraman and Damien Bruckard encourage and develop debating in universities in Africa. MAD is a debating society which has won the World University Debating Championships for an unprecedented three consecutive years. African Voice was set up with the hope of sending elite Australian debaters each year to countries in Africa that are transitioning to democracy, but have limited exposure to debating. In 2013, African Voice will be sending three World Champion debaters, Nita Rao, Amit Golder and Victor Finkel, to run training programs. “Volunteering their unique skill set to make a difference in disadvantaged African communities, these trainers will work in partnership with local NGOs to run workshops that empower university students by strengthening their public speaking confidence,” Kiran said. The workshops incorporate ‘train the trainer’ modules designed to give African communities the ability to run their own debating programs in the future. African Voice has had a major impact, receiving high-profile support from the Director of the ANU National Centre for Indigenous Studies and 2009 Australian of the Year, Professor Mick Dodson AM, and the Attorney-General of Australia, the Honourable Mark Dreyfus QC MP. To date, it has held workshops for over 1200 university students from South Africa, Rwanda, Namibia and Zimbabwe. In 2013, African Voice will re-visit Zimbabwe, South Africa and Rwanda, and conduct their first workshops in Uganda, Tanzania and Nigeria.